Day three and day four. It's Sebastian again, sorry for the unimaginative title. Jim and I are on the train again, we said our 'goodbye's to Shilling, gave her quick sweep and tidy and headed off forAlvechurch railway station. I even snuck into the toilet's behind the pub and had a shower before we left: wouldn't want to turn up on mum's doorstep looking unpresentable would I?! Yesterday moring was a fairly relaxed start, no more getting up at six. But we were on our way soon enough. The place where we'd moored was near a few bars but the only real noisemakers were the local geese. Jim decided that they are the undesirables of the aquatic bird world and are, therefore, Chavs. He told them this quite often. Once again Shilling started and ran with no trouble whatsoever, we kept the fire going so it was nice and warm inside, despite the need for several layers and gloves whilst steering, and that was welcome when our journey ended and we huddled in the warm and waited for the pub to open. The pub was called 'The Weighbridge' and it was fairly easy to see how it had got its awards. The landlord was friendly, the food was lovely, the building was homely and the beer was varied and tasty. If I remember correctly there were four real ales on tap and three of those were local. After that was a short walk back to the boat and bed, the story ends there but as I glance out of this train's window it's easy to spot the canal alongside and the route we took. I'm afraid that there is nothing much to report today. Woke at six and had several cups of tea. This time with fresh milk rather than UHT which apparently went out of date last november (it says that but surely UHT lasts for ever provided the seals not broken, ours wasn't lumpy oranything, it just tasted of UHT. God, I'm a bit of a snob aren't I?) and a bit of cold pizza for breakfast (also had some for lunch; told you it was massive) and we were off again. Nothing go stuck in the prop. There were no boats full of men on probation for Jim to shout 'bad boys' at. Stopped at twelve and had a bit of a chill, as Jim thinks all young people call it, and we're still chilling. Very relaxed day. Still on schedule as well so that's a good thing. I may go pop the kettle on. This is not Sarah blogging. This is not even about Chertsey. 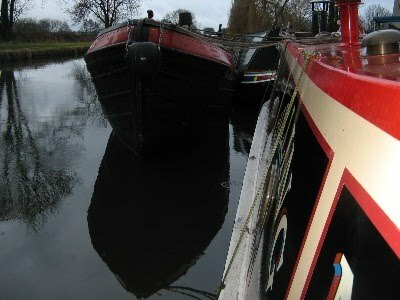 This is a pirate broadcast by her son, formerly known as lock boy, from aboard NB Shilling which he's helping move from Stretton Wharf to Tardebigge Wharf. Today was the day of 'The 21' (Although there's actually been 22 Locks today, starting with Autherley Stop lock) but before we managed to reach even the first lock we had to set about solving the mystery of the unstarting engine (as the tale will henceforth be called) and Jim set about this mystery quickly and discovered that the leads to the battery had shaken themselves loose of the terminals. Armed with his trusty adjustable spanner and a borrowed battery charger he set about righting this problem and soon enough we were on our way. Having started off early and missed breakfast we settled for an earlyish lunch before hitting the multitude of locks before us. The last time I came boating the weather decided it would rain pretty much whenever I did a lock so it was comforting to discover that nature had not forgotten my face since then and it dutifully began to spit. No dampening of spirits however: I was back by a boat with a windlass in my hand and that made me very happy indeed. First there was a little warning bleep and then Jim announced that there was something stuck in the prop. Ok, maybe calling it a disaster is a little strong. Jim set to hacking what appeared to be a nylon tracksuit jacket (which we decided was either discarded by some chav else some other chav had drowned in it and his body been carried away. Because of the hassle we were both rooting for the latter I think...) So it was intermittent bowhauling for a few locks as new bits of debris were caught up and Jim would disappear up to his elbows through the weed hatch to sort it out. Nevertheless we arrived at Broad Street basin slightly ahead of schedule so, both of us absolutely gagging for a cup of tea, I put the kettle on. Since then Jim's got the fire going and I've had a delightfully hot shower followed by a pint of beer, half a massive pizza,and a nibble of chocolate. I'd better say goodnight to you now and do some Philosophy work for university. More tomorrow. P.S. I did give this a quick scan for errors but if you find any please forgive me... I've just typed this whole thing out on my kindle. Yesterday we went to Eastbourne, because we thought the charity shops might be worth a look. Charity Shop Tourism hasn't made it to Sussex yet, so perhaps I could start filling in the gaps. Newhaven for example, throws up a few occasional treasures, but then I do do the rounds (Searchlight (that's a local one), PDSA and Scope) once or twice a week. Lewes is wonderful; occasionally dear but worth it. I have paid £7.50 each for two Monsoon skirts, but been pleased with them, and the other week I got a pair of Maiko Dawson (no, I'd never heard of her either, but anyone who doesn't even list prices on their website must be good) shoes. Brighton is stupidly expensive. Eastbourne was disappointing. There are lots of shops, but the stock was generally poor, and I wonder whether this is because of the growing habit of charity shops to try to be clever and cream off the best stuff to auction or sell in special shops in more affluent areas. We ended up going in at least half a dozen shops and buying absolutely nothing - which must be a record. Then this morning, I read this article in the Observer magazine. I would write in, but they don't have a letters page; or leave a comment online, but it doesn't seem to have the facility, so I will leave my comment here (what else are blogs for). "The idea is to make them bright and vibrant and to remove the stigma of charity-shop shopping"
"We tend to think we'll auction all of those clothes that people feel are a bit too good for the charity shop"
Now, I understand that the purpose of charity shops is to make money for their cause. But unless you are selling a premium product (and 99.99% of second-hand clothes do not come into that category) retailers for hundreds of years have understood that the most profitable way to do that is to pile it high and sell it cheap. Trying to cream off the best stuff is a waste of time (yes, even volunteers' time) and money, and if it becomes widespread charity shops will lose customers. It's the thought of getting a prize, that extra special bargain, that brings us through the doors week after week - but once we're in, we usually tend to buy something that catches our eye. Once all there is on the rails is Primark stuff priced at more than it originally cost (which happens often), then there will be no point in going at all. When Baz and Jim move Shilling next week, Baz is going to take over the blog. He is going to do it on his Kindle (so no piccies)... a test post has uploaded to drafts so it must be possible. As he is going to do it using my login, this apparently makes him a pirate. Watch this space... but I am NOT responsible for what follows! Last summer... it seems so long ago... Bill and Michelle brought Shilling to Stretton for blacking and an inspection and a bit of work. We said that we would take it back to their mooring for them after the work was finished. But there was more work than expected... then everything froze... then suddenly I had loads on at work... and it was starting to look as if we would never achieve the task. But, I am pleased to announce, at last it is in hand. I can't find more than three consecutive days, but Sebastian has a reading week coming up, so he and Jim are going to undertake the task. If it were only a week later he could be doing the 21 on the 21st, which is his 21st! I just realised that. Creeping up in the charts - and overtaking Chertsey - is the slightly unusual blog of Siskin. Siskin is a new boat, based on a Yarwoods' Cowburn and Cowper boat, in the process of being built at Brinklow Boat Services by Simon Wain, with a great deal of input from the boat's owner, Steve Goddard. It's unusual firstly in being a build blog which follows the progress of a serious, detailed, replica (if I can say that) boat, and secondly, for the detail it provides of the work that goes into it - updated almost daily, often after a really long, hard day. If anyone ever doubted that a quality bespoke boat was worth what one costs, then this will reassure you. A fascinating read. There is also a Siskin blog on Canalworld, with interspersed comments - and it can be read in chronological order. Now, I haven't looked into this too closely so far, but I was under the impression that BW turning into some sort of national waterways charity (details and name to be settled on in due course) was a foregone conclusion. Go inland and a similar battle is raging. The future of British Waterways – the quango in charge of 2,200 miles of canals and waterways – is under review at the department for the environment. More progressive-minded ministers want it made into a National Trust-style co-operative for the good of boat owners, ramblers and anglers. This would protect its endowment and public service ethos from the £400m fire sale that Treasury chief secretary Danny Alexander is considering. An ominous departmental silence seems to suggest the privatisers are pushing ahead. If Hunt is right, then that is genuinely frightening news.